Pool – 3.5M to 5M pool, diving pits or deep end of pools with diving boards will be suitable. Mustn’t have any ledges or other projections which may block easy return to surface of players. Substitution requires exit from the pool so consider pool to water height and access to poolside. 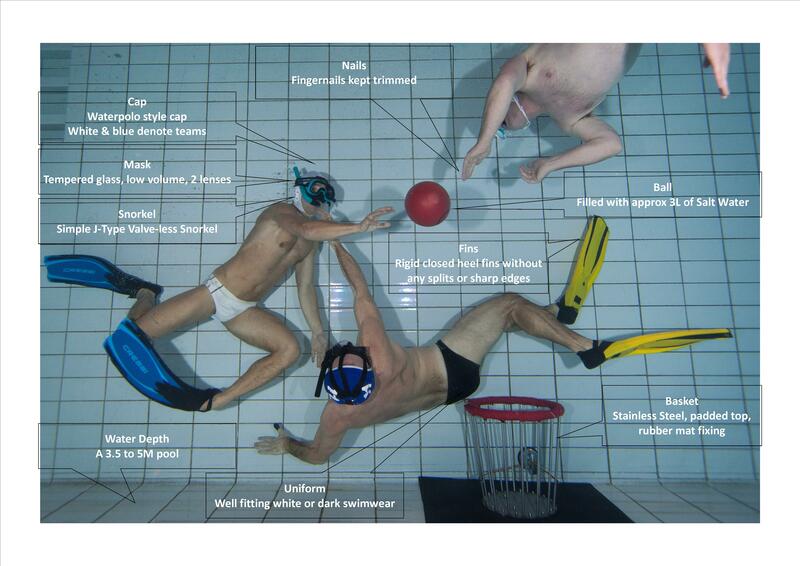 Ball – Regulted underwater rugby specific balls (Women 490-510mm Circ, Men 520-540mm Circ, Neg Buoyancy 1000-1250 mm/s) Filled with Salt Water (Apporx 5L Water to 1800g NaCl) Filled weight 3000g +/- 20g. Basket – Made of stainless steel to the regulation dimensions (Bottom 320mm Dia, Top 390-400mm Dia, 445-455mm High) . Padded on top with neoprene / tape. “Fixed” to the pool bottom using rubber mat or physical screws. Can be expensive / difficult to find, may need to commission. Mask – Scuba / Snorkelling / Spearfishing / Apnea mask. Low volume to make equalising easier. Tempered Glass to minimise injury if broken. Some leagues require two lens style to minimise breakages through diving / flexion. Cressi SuperOcchio one of the most popular. Cheap / Easy to find online. Snorkel – Simple, valve-less J-type snorkel cut to minimum length to avoid snagging and make clearing quicker but sanded to ensure no sharp edges. Decathlon cheapos are most popular. Very cheap and easy to find. Cap – Waterpolo style cap with ear protection. Make sure there are no perforations in ear protection aligned to the ear drum to protect against water force injuries to the ear drum. One light and one dark (blue) required per player. Expensive to buy singles, cheap to buy club set. Fins – Closed Heel rigid fins with no sharp edges, splits or other “features”. Simple cressi or mares fins are fine to begin with but can find uwr specific fins by leaderfins etc. Cheap through to Expensive depending on taste all easy to find online. Uniform – Tighter the better, less drag and less for opponents to get hold of. Gents should come to terms with wearing trunks / budgie smugglers. Ladies, one-piece, no bikinis please. One set of light and one of dark required per player. Dark very cheap and easy to get hold of online. White can be more expensive / difficult to get hold of. Hygiene – No oil / moisturiser / sun-cream to be worn. Nails to be kept trimmed. Long hair to be secured.